The author is an experienced ex television and video engineer and has been involved in electronics since childhood. Therefore, no attempt should be made by any inexperienced person to construct the device featured in his story. Please read it, as it is meant to be read – as a story. Initially, I purchased 8 fly zapper rackets – the single diode types. 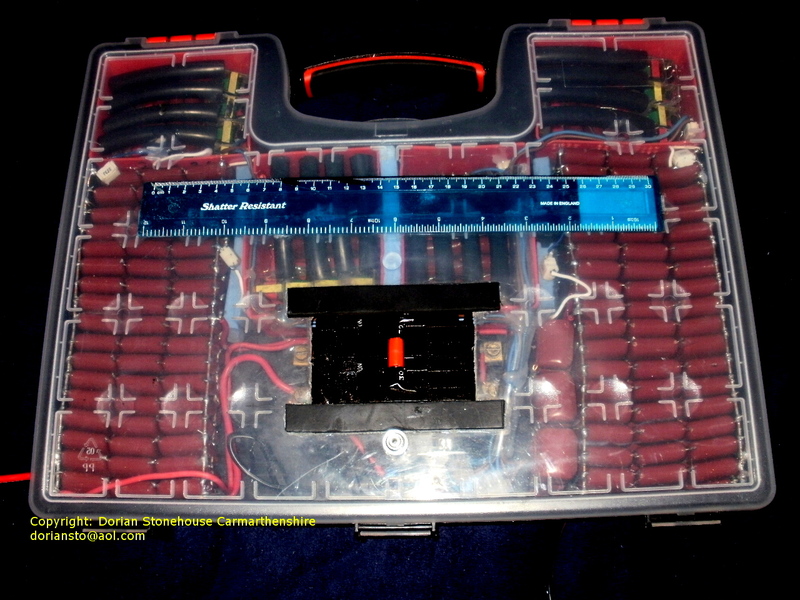 I discarded all the diodes, capacitors and 10 Meg bleed resistors that came with the zappers. On the low voltage end, I replaced all oscillator transistors with 2sd1616 transistors, thereby improving overall performance. 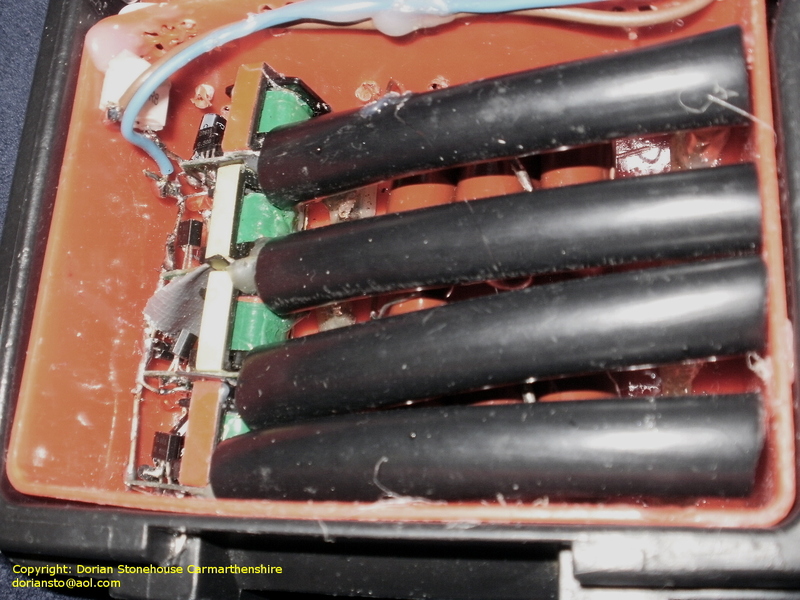 The upgraded diodes were type RGP02-20E (2000 volt at 0.5amp), and capacitors – 0.470 μF. The bug zapper output then rose 1.2kV to over 2kV! The arrangement is very simple, as can be seen ⇓⇓. 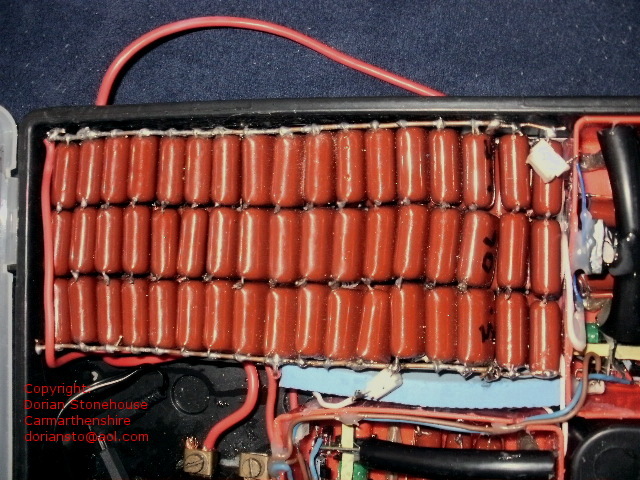 The gaps between the copper tracks at the output of the high voltage transformers are very small. This could easily have resulted in destructive high voltage arcing and, hence, component (word censored by Google adsense). 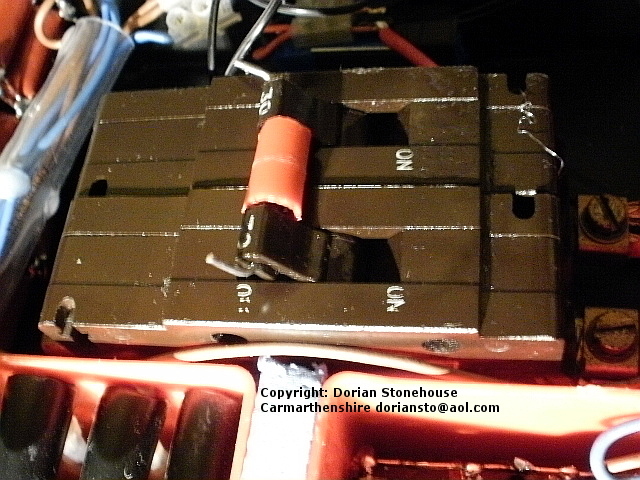 The remedy was to apply hot glue across all the gaps, thereby shoring up high voltage insulation. All plastic box modules have 4 columns, consisting of three diodes in each column. 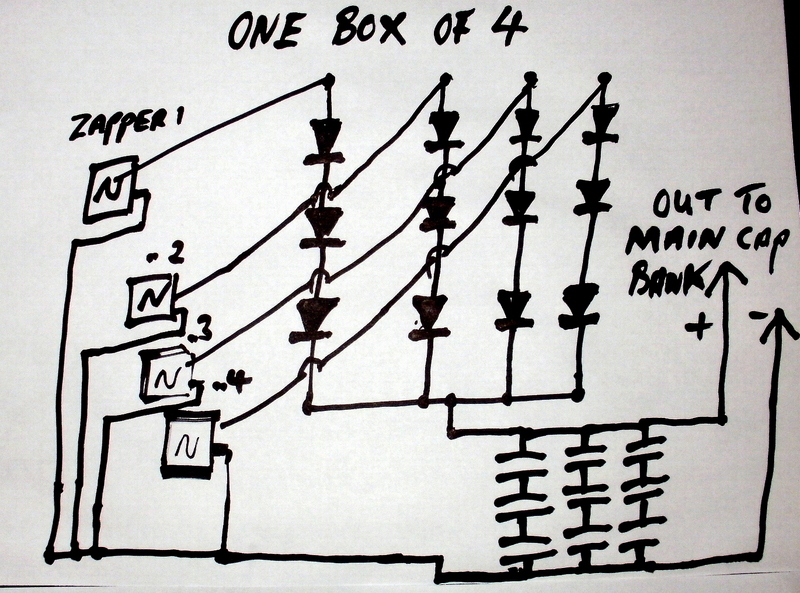 The diodes are as far away from the transformers as space will allow ⇑⇑. Important: The whole diode setup must be covered in hot glue – for insulation, or high output voltages will (word censored by Google adsense) your oscillators to smithereens! The black plastic cover shown⇑⇑ is just split cable sheath. 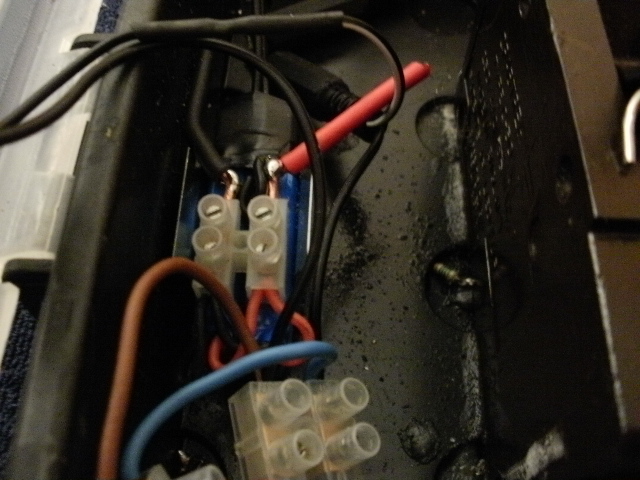 Beneath the sheath is a thick coating of hot glue, leading to the diodes. To increase the capacitance of the module, hence output, I used 6 x 0.47 μF capacitors per box⇑⇑. 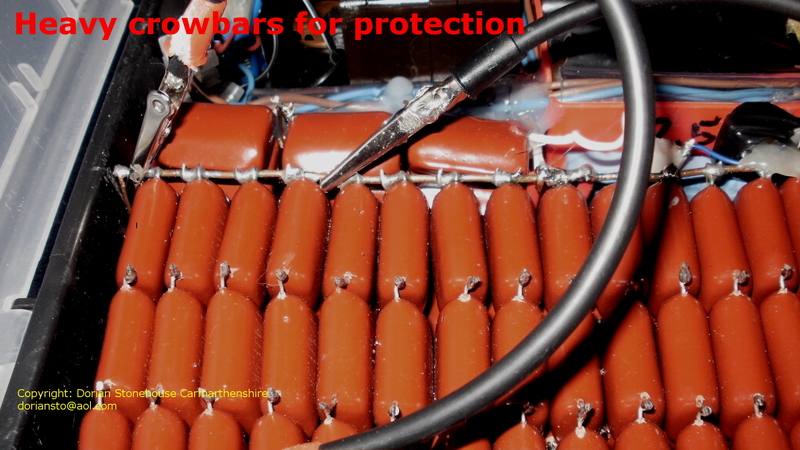 Each capacitor is rated at 1200 volts. 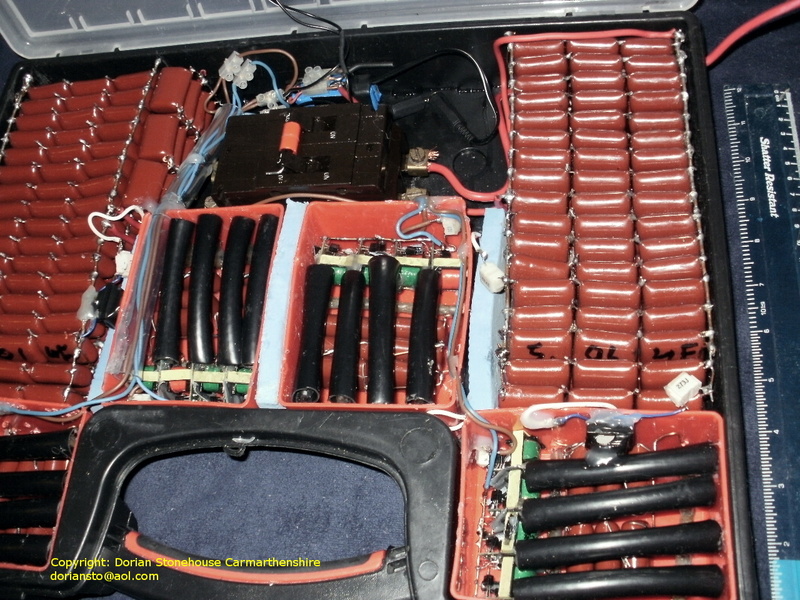 Looking at the left of the main case⇑⇑, I connected module 1 and 2 high voltage outputs in series; thereby generating about 4kV output from 8 bug zappers. Across the two left side modules, I connected groups of 3 capacitors in series, making a total of 102 capacitors. Each capacitor is 0.47μF, with 51 capacitors in each of the two layers. 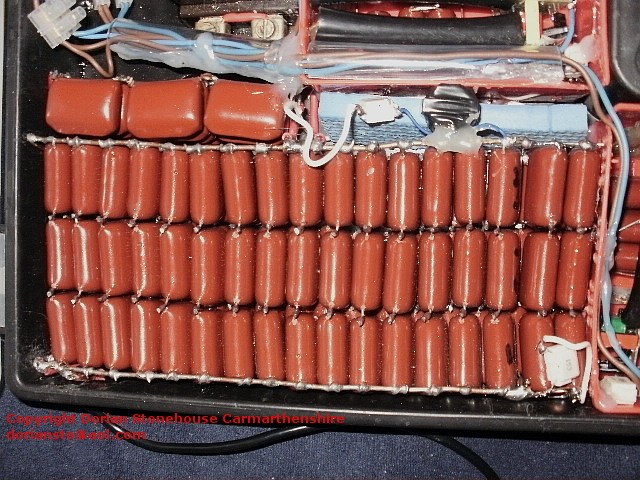 An additional 12 capacitors were added to correct for low capacity, giving a total capacity of over 5 μF. 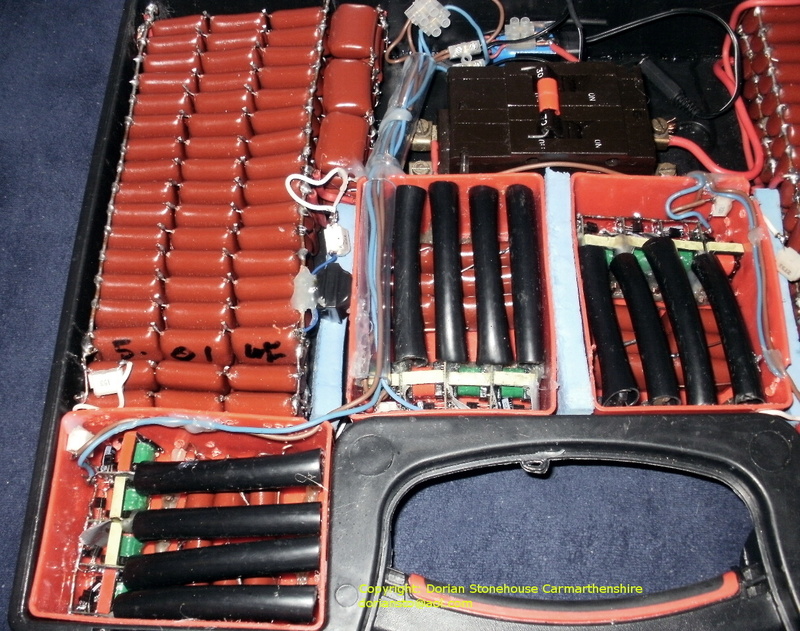 The charged capacitors are connected to the obsolete mains consumer unit switches, located in the top centre of the case (shown later). 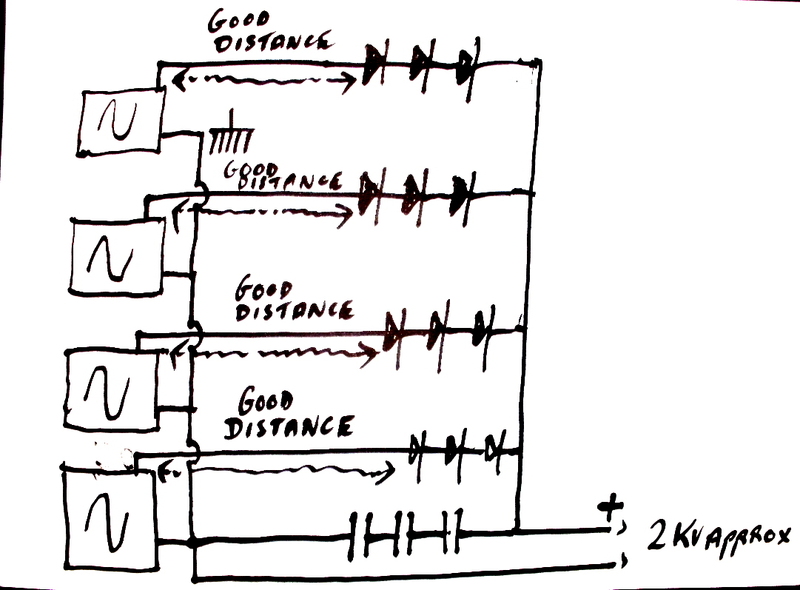 The high voltage output is then applied to a very thin wire whisker – two or three cm long (it’s not critical). I wore heavily tinted goggles and protector earmuffs. There was (word censored by Google adsense) and a (Word censored by Google adsense), followed by blue smoke – success! I will try and upload a short video showing the results. With another 8 zapper rackets dismantled and the boards treated in exactly the same way as described above, things really started to take off! The right-hand capacitor bank is of course a mirror image of the left side, minus 12 capacitors, thus making the total value of the left and right banks around 12 μF (222 capacitors). Spike suppressor chokes are connected between all module outputs and the capacitor banks; thereby, suppressing any unwanted spikes being fed back to the oscillators and (word censored by Google adsense) them! Old Mains fuse box switches – taken out of retirement! I used two old mains power switches, each rated at 30 amps, and connected them in series⇑⇑. “View from the top” picture ⇑⇑ shows how I connected the switches to the two capacitor banks. All oscillator modules are connected in parallel. 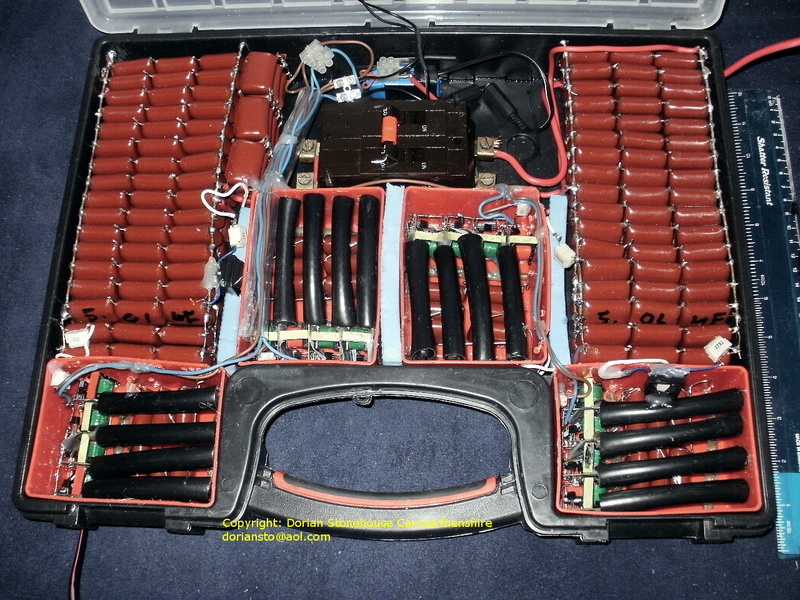 They are then connected through a push switch to a 3 volt lithium ion battery⇑⇑. 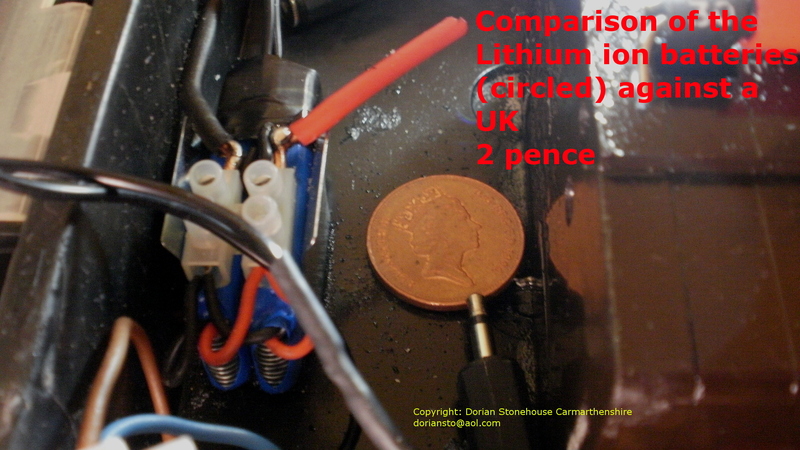 Although tiny, the battery is more than adequate to cater for the voltage/current needs of the modules. 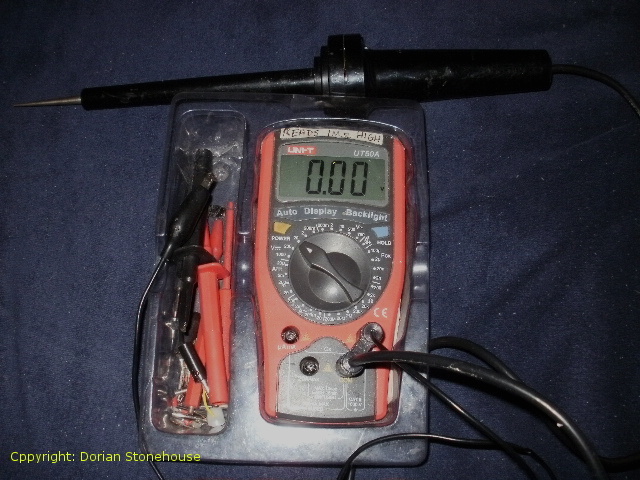 The trouble with high voltage measuring probes is that they drift over time, thereby giving false readings. To align my 30Kv probe, I just turn up the output voltage on my EMI PM28B power-supply to 2Kv, and then adjust the probe potentiometer to read 2 volts on the multi-meter (20 volt scale). 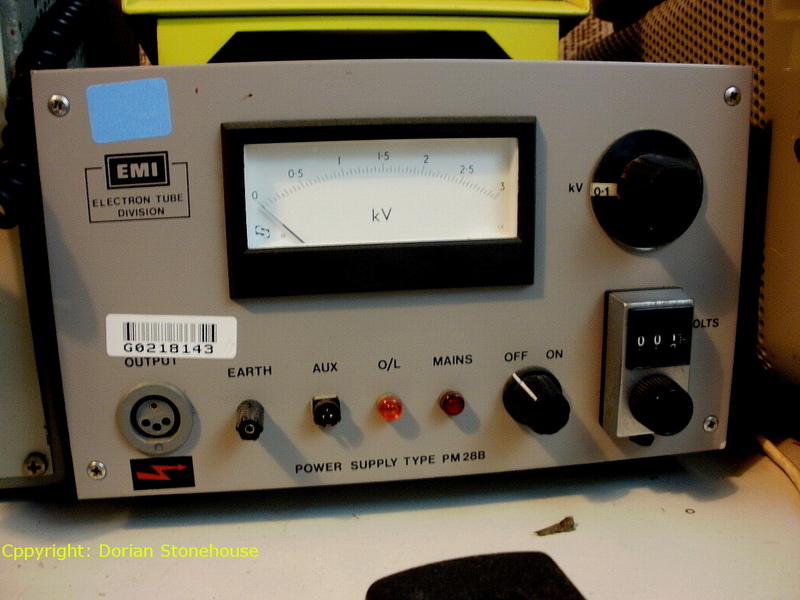 To complete the excercise, I turn up the EMI PM28B output to 3Kv, and the multi-meter should read 3 volts, thus establishing at least a degree of linearity.